The Home page is a dashboard where you can quickly evaluate the current state of the system, see the latest changes, and access the most frequently used actions, such as recently modified articles. Knowledge base: : Public URL of the selected knowledge base (KB) and a list of recently modified articles within this KB. Latest searches: Latest search queries in your KB, which you can use to detect the most popular articles and topics of interest. Help & support: Links to helpful information about AIstant, such as an overview of the product at the website, user documentation, and customer support. 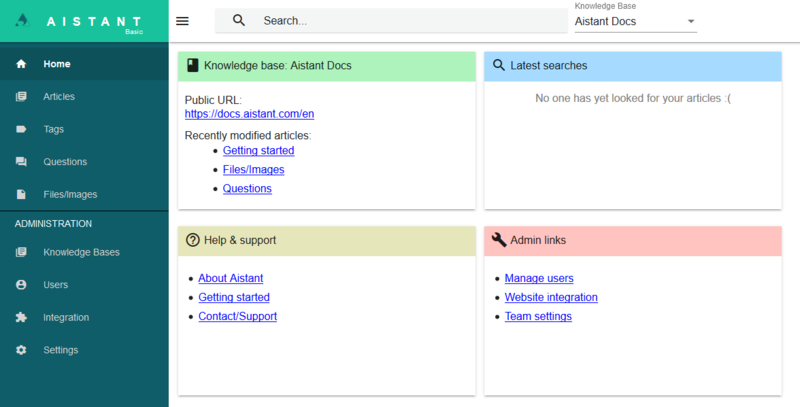 Admin links: Links to administrative data that you can also find under ADMINISTRATION in the navigation bar on the left: user management, integration with the product website, and team settings.